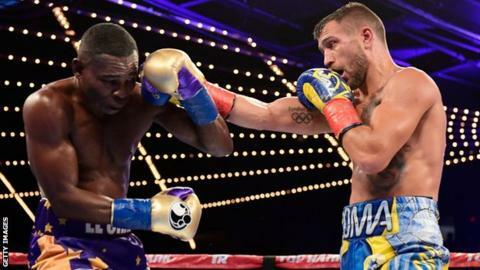 Ukraine's Vasyl Lomachenko retained his WBO world super-featherweight title as Guillermo Rigondeaux retired after the sixth round with a hand injury. Cuban Rigondeaux is the fourth opponent in a row to retire against Lomachenko. The much anticipated bout at New York's Madison Square Garden was the first time two double Olympic champions have faced off. All three judges had Rigondeaux, who moved up two weight divisions for the bout, behind when he retired. Lomachenko is the "greatest fighter since Muhammad Ali"
"Maybe I should change my second name, now my name is 'No Mas Chenko," said Lomachenko, 29, who extended his record to 10-1. Rigondeaux, who won Olympic gold at Sydney and Athens, holds the WBA super-bantamweight crown. The 37-year-old, who was warned by the referee several times for foul play, began telling his trainer after the third round that his left hand and wrist hurt. "This is not his weight so it's not a big win for me," added Lomachenko, who won gold medals at the Beijing and London Olympics.